Trees for free.org – 3rd Annual celebration! 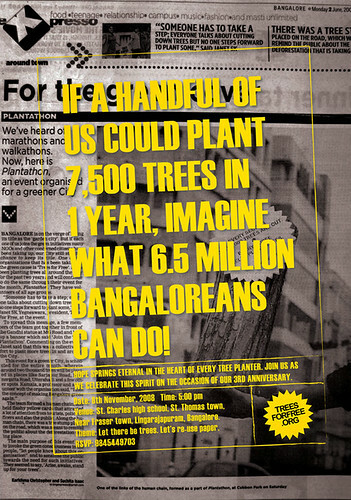 The treesforfree 3rd annual celebration starts at 5:00 PM on 8th November. There will be a show on environment by school students, and various other programs. Please come, along with your friends, family and colleagues, and pass on the message to all. This google map link will provide you directions. Contact Janet at 9845449703, if you need any more information. TOTO FUNDS THE ARTS (TFA) invites entries for its fourth annual TOTO awards for Indian creative writers in English. Two cash awards of Rs. 25,000 each will be given in January, 2009. BUT: Entries are only invited from young people — over the age of 18, and who have not celebrated their 30th birthday before January 1, 2009. ALSO: The spirit of the Toto Awards is to identify promise and encourage young talent. Therefore, do not submit an entry if you are already an established writer. TFA is looking for entries in three genres –– short plays, short stories and poetry. The submissions should not exceed 7,500 words. You can submit any combination of your writing in the above genres, as long as the entire submission is within the stipulated word limit. Entries should reach TOTO FUNDS THE ARTS (TFA) by 4 October, 2008 at the latest. There will be no extension of the submission date. Entries should be sent in soft e-mail copy to totofundsthearts@yahoo.com as well in hard copy form to the above address. Please address queries to the same e-mail ID. Entries must be accompanied by a signed statement confirming the applicant’s date of birth, whether the applicant’s work has been published in print (give details), and also affirming that the submitted work is original. Please ensure that the hard copy does not carry your name on it. Submitted entries will be given code numbers to protect applicants’ identities from the jury during the judging process. TOTO FUNDS THE ARTS (TFA) is a not-for-profit public trust set up in memory of Angirus ‘Toto’ Vellani, who was intensely passionate about music, literature and films. July 25 to 27 (Friday to Sunday, 10 am – 5 pm). Renowned poet, playwright and publisher Keki Daruwalla from New Delhi and poet and novelist Anjum Hasan from Bangalore will conduct the workshop. Those under 35 but over 18 may apply by sending in a maximum of three poems and/or a short story of no more than 3,500 words. Please note that the workshop will cover both poetry and fiction. The last date for submissions is July 15. The workshop will include discussions on the two genres, discussion of work submitted, as well as on-the-spot assignments. Note: All submissions will be screened by the facilitators before acceptance. A maximum of 10–12 participants will be chosen. Outstation applicants will have to make their own travel and lodging arrangements. For further information please write to tfaindia@yahoo.com or call 09880623357 between 10 am and 5 pm, Monday to Saturday. So I’ve been going for Bharat Thakur’s yoga classes for a few months now and it’s made quite a difference to my health. I’ve increased my flexibility and stamina over this time. A lot of people also lose weight through the exercises. Mine though has been less significant (mainly because I like my meals too much!). Anyway, though Bharat Thakur doesn’t personally come and teach you (sadly :-) the instructors are pretty good. Right now, JP Nagar, Koramangala and Indiranagar are some of the areas where the classes are being held. These are the batches at Koramangala. The other venues might have different timings. You can also get one trial class, but do be prepared to sweat it out because the exercises are slightly improvised and are faster paced than the other yoga schools. So you might find the class slightly more strenous, but in the long run it’s a good way to burn your calories and get fit! To come in for a trial class and for the current fee structure, call Ramshad: 9480336648. It was great to see a really big turn-out at the Sunfeast 10K run last month. It’s events like these that will popularize physical activities like running and walking – a great form of exercise as our lives become more sedentary! For those of you who live around the JP Nagar area, there is the Jolly Colors 5K – a run followed by a Painting competition will be organized at JP Park on Sunday June 15. Run and then paint and express yourself! A mighty fun way to spend a Sunday morning with the family! You can either bring your own paint and brush and palette for the painting competition or use the painting supplies provided by the organisers. All finishers in the 5K run event will get a prize. Painting event prizes will be decided by a panel of judges. There will be prizes for all-round good performance in both running & painting events. This event is being organised by Run Walk India. And take it from me, there’s nothing as refreshing and fun as an early morning run! JSS-Advanced Jewellery Design Centre is conducting a free job-oriented training programme in Computer-Aided Jewellery Design from May 5,2008, the duration being 6 weeks. 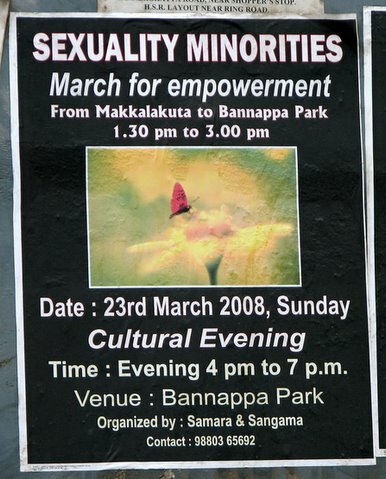 The programme is sponsored by Devaraj Urs Backward Communtiy Development Corporation, Bangalore. Candidates should have passed their 10th Standard exams, and should be economically backward as per government norms. The age group is 18-35 years. Last date for application is May 3, 2008. Please pass the word around to those around you who are not well off and could use this opportunity. Jewellery design can be a satisfying, well-paying career. Campus Srinivasapura, Uttarahalli, Kengeri Main Raod, Bangalore 560060. Ph. 2271 8579, 98447 11592, 98457 18366, and 98800 12344. Ashoka Trust for Research in Ecology and Environment (ATREE), Bangalore chapter is organizing a free ‘Vacation Training Programme on Bio-Resources’ from May 6th to May 26th 2008. 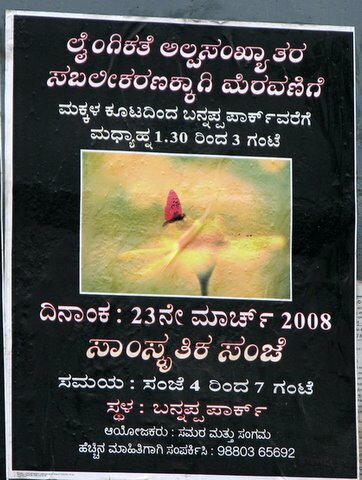 Funded by Department of Bio-Technology, Government of India, this program consists of lectures and interactive sessions with eminent scientists and experts in the field of biology and bio-resources, visits to research institutes, orientation to skills required for field-biology and out-door camps. Students who have appeared Class X examination in 2008 from recognized schools in Karnataka are eligible to apply. For application forms and other details visit http://atree.org/vpbr_0508.html or contact 98806 12474. Last date to receive completed applications is 28th April 2008.